There’s a saying that goes “the early bird catches the worm”. Well, unfortunately, I wasn’t the early bird to catch this worm. However, even though I only picked up on this story a month too late it still holds massive relevance to all those big wave surfers, who to this day, carry their massive testicles around in trollies. I will always be amazed at how these surfers find the courage to ride waves of such epic proportions. This act, of riding monstrous waves, can only be understood by those super-athletes, the brave men and women who ride them. For the rest of us, sitting in our offices watching these videos while the boss isn’t looking, can only use our imaginations and dream of riding gigantic waves. For us, it’s completely incomprehensible and unfathomable. Nonetheless, I have attached a video that illustrates the epic nature of big wave surfing. Surfing is indeed the most exciting sport in the world. 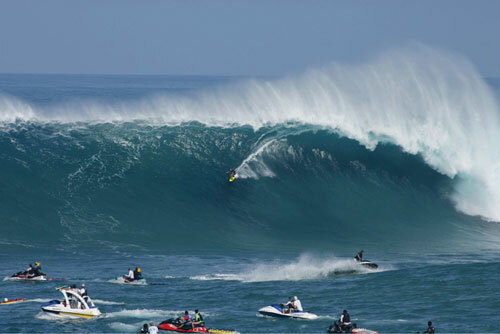 This entry was posted in News Desk, Surf and tagged big wave surfing, Billabong xxl Big Wave Awards 2011, surf, surfing, waves. Bookmark the permalink.